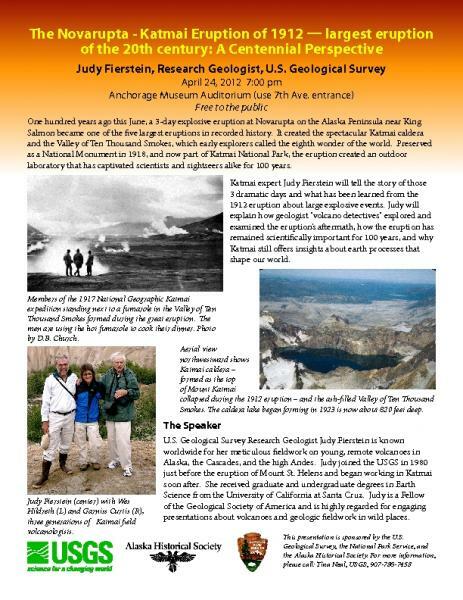 USGS Geologist Judy Fierstein will present an evening lecture at the Anchorage Museum on April 24 at 7 pm as part of the centennial celebration of the anniversary of the great 1912 eruption in Alaska. Judy is one of the worldâ€™s few experts on the 1912 eruption and its impacts. She will present fascinating and public-oriented information based on her detailed volcanologic work in the Valley of Ten Thousand Smokes since the early 1980s.